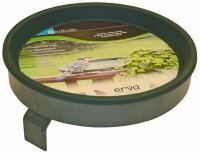 Screw mount bird bath is made from a 2-1/4" wide steel band that's 14" in diameter. Includes the green plastic (BPA free US made) dish with the perfect 1-1/4" depth. Heavy duty back plate. 4 wood screws included. Baked on powdercoated green finish. Made in USA.